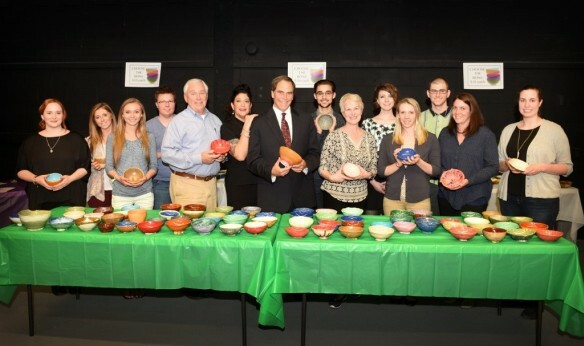 At the end of April Rowan's Art Education Department hosted an Empty Bowls Event where Joseph's House was the recipient of the proceeds made at the event. Potters donated bowls and other works of art. Event attendees bought bowls which were filled with homemade soup. This event showed how the Art Community can partner with an organization like Joseph's House working with those who are hungry and homeless. Thank you to Rowan, local artists who donated, and those who attended! May 19th was a special day for Radio, a longtime employee of Joseph's House, as he received his Bachelor's degree in Social Work from Rutgers University. At 59 years old, Radio has overcome many obstacles. Radio battled a drug addiction for 25 years living on the streets and in jail before getting sober in 2009. Since 2009, Radio has been on a mission to improve himself. He has benefited from the services of many provider agencies and dedicated staff that encouraged him to take advantage of the drug counseling, job coaching and education services made available to him. Radio came to Joseph's House in 2010 through our partner, New Visions. Radio needed to stay busy and felt that no one else would hire him. John Klein took a chance on Radio and he has been a part of the JH family ever since. By the second season Radio was at JH, he matured by starting to taking on more responsibility, including working both days and evenings doing intakes. By 2014 when JH opened full time at 555 Atlantic Ave., Radio was promoted to a shift supervisor. Since getting sober, Radio has been pursuing his education. He had to start at the beginning and obtain his GED, followed by his Associates Degree and Bachelors Degree. Radio combines his education with his personal knowledge of being homeless and addicted for many years to assist and relate to the Guests of Joseph's House. Ernest “Radio” Lindsay -- Congratulations on this major accomplishment! We are thankful to have you on our team and look forward to continuing to work with you!